can use any output tube and it autobiases to whatever output tube you use. none that i have found. it weighs 46 pounds if you can call that a weakness. This is a primo amp. i just got a good deal on it. I had been aware of the Prologue 5 since it was introduced, and was impressed. I was finally able to purchase mine when I found out it was on sale for $1449. I was happy with my 300B monoblocks for most music, but wanted more power for amassed symphonic and choral works. This amplifier rocks but does not sacrifice the delicacy of the 300B's. I am running Tannoy SRM 15X speakers, 94db efficient, and I cannot hear any hum right up by the drivers. Every type of music is well-served and very believable. Highly recommended! Heavy-duty build in a compact unit; plenty of power for most typical home applications, even if you have big speakers; affordable tube sound; simple, elegant design. I have not found any so far. The Prologue 5 is a compact but heavy and elegantly-styled power amp that is extremely well designed and built. It offers 36 watts per channel, something that I had to think carefully about when making my purchase decision. This amp replaced a 200 watt solid state piece in my system, and I was driving a pair of Thiel CS2.4 speakers. The Thiels are pretty big and heavy, but are considered reasonably efficient. Still, I wondered about 36 watts. Well, the results have been outstanding. The Prologue drives those Thiels without a problem. I listen primarily to classical, so there are times when I want to reproduce the sound of a big symphony orchestra playing a huge piece of music and have it sound as if I were hearing it live (adjusted for my listening room, of course). The Prologue does it beautifully. What I really like also is the warm sound of natural instruments, such as strings and piano, since I listen to a lot of chamber music. When I change pace occasionally, and listen to jazz, I have no loss of enjoyment whatsoever. Jazz vocal music is a favorite, and again I can close my eyes and imagine being in a club with the musicians right there before me. 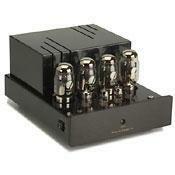 If you want excellent value for the money and think it is time to try tubes, this is an amp you must consider. By the way, the tubes heat up, but they don't radiate heat. I have detected no hum - 0 - even when I put my ear up close to the speakers. My congratulations to PrimaLuna and the US distributor, Upscale Audio. Everything happened the way I expected during the purchase.I have had no reason to use customer service after the purchase. By the way Upscale also sells tubes, so they know exactly what replacements you need when the time comes. The Prologue 5 is heavy, uses first class internal components and is very well designed. The exterior design is very simple, yet elegant simplicity is something I think is great. This amp has 36 watts per channel, but don't let that number fool you. I am driving a pair of Thiel CS2.4 loudspeakers and the Prologue 5 has not disappointed me for even an instant. As a matter of fact, it took me a while to decide on this amp because of the Thiels. The Thiels are pretty big and heavy (70 lbs each) and relatively efficient. However, I had been using a 200 amp solid state amp to achieve concert hall reproduction (adjusted for my listening room at home, of course) on big orchestral pieces. When I have put the Prologue 5 to the test, it has passed with flying colors. I listen to classical music 80% of the time, so excellent reproduction of natural sound is very important for me. I listen to a lot of piano and string chamber music. The reproduction I get now is probably the most accurate and satisfying I have ever heard at home (something I've been doing for almost 40 years). When I change pace and listen to jazz vocalists, it really seems as if the singer is right there in front of me. Yes, the tubes get hot, but they don't radiate heat. I have yet to hear any hum, even when putting my ear up against one of the speakers. I have not found a single weakness with the Prologue 5 so far (and I don't expect to). The Prima Luna Prologue 5 is a compact, but very solid tube amp that is beautifully designed and built to meet very high specifications and standards. From every possible aspect this product shows quality. If you want something with lots of extra lights and buttons that probably do not have any functionality, then this is not the amp for you. However, if you want a product that has been designed and built to be elegantly simple and to focus on performance, then this is definitely an amp for you to consider. I have had this amp for several months, and I can honestly say that there is not a single thing that I would want to be changed on the Prologue 5. This is product represents outstanding value for the money. I had excellent customer service from Upscale Audio. I'll go back to them without hesitation if there is something else I need. This is my first tube power amp. In the past I have run a variety of solid state amps by Rotel, Adcom, Acurus and Harmon Kardon. After owning this amp for 11 months I've sold it again. I powered a pair of Sonus Faber Cremona Auditors (preamp EAR 864) with it and although at first I was seduced by the sound, the huge soundstage, the strong bass and emotional mids, in the end the treble wasn't smooth enough for my taste. It's very forward sounding and has an astonishing presence. In my small listening room (approx 16 m²) treble became harsh at times. Too harsh on the long run. I now listen with great satisfaction to the same system with a Luxman L-505f integrated. The tubes had a deeper soundstage and overal sounded a tiny little bit more natural but only now I notice the lack of speaker control the PL5 had. It may match better with other speakers. None, never had a hiccup from any of them. I was heavy into mosfet amps and built 4 Musical Concepts PA3B DH200/220's with all the goodies Black Gates , 27,000uf 80v power supply caps, the works as well as two similiarly modified B&K ST140's paired with Parasound preamps and Monitor Audio Speakers . I then got the itch to try tubes after a few miscues with Jolida, Antique Audio, I purchased a Prologue II, which has been replaced with the Prologue 5 and a Rogue 66 Magnum, giving me remote volume control. I love the Prologue 5. The only thing better would be a pair of Prologue 7 monoblocks. In my second system I went through a similiar plethora of amps, Jolida, Cayin TA30 modded, to an AE25 standard then Signature also paired with another Rogue 66 Magnum tube preamp. After realizing I never use the remote as I can reach the rack from my chair, I sold the AE signature Super amp and rogue preamp and replaced them with a Prologue I. I guess I've come full circle. I highly recommend saving yourself some aggravation and just deciding or better yet calling Kevin at Upscale and asking him what Prima Luna Prologue to fit your needs/system.They are the best tube amps for the money I have ever heard. Haven't had to use it but I've heard it's excellent. Jolida, ASL, Cayin TA30 Bizzy Bee(excellent but bias pots drift ) If not for Upscale and Hermann, this chassis would never have been taken to it's current level. Full, rich sound. Mids and bass to die for. Highs are a bit too pronounced at high SPLs, but that could be room acoustics - I'm still experimenting with taming that beast. Wow, were the reviews on this beauty ever right. This amplifier simply sounds sweet. I had it running a pair of Triangle Titus monitors - wonderful sound. Then I just acquired a pair of Opera Callas monitors, and this pairing has me in listener heaven! I've only put 15-20 hours on the amp so far, and the sound already is opening up. Other reviewers have said it requires about a 40-hour break-in, and I'm anxious to see if it can get even better than it is now. For the money, this is a fantastic piece of equipment. Hell, it's fantastic price-independent. harmonic decay depth of soundstage, just the pure sweet sound of tubes. i cannot belive how great the sound is. you have to buy a few tubes every few thousand hours, not a big deal. well worth it for that glorious sound. after using tube preamps for fifteen years i wanted to try a tube amp. not long ago i bought some meadowlark osprey speakers , that i just love, the designer said that the speakers were voiced with tubes and he recomends them.i then called kevin deal at upscale and told him that i wanted to tip toe into tubes his recommendation of the prima luna five was a great call. as soon as i put them into my system i knew that i was in for something special. that little tube amp embarrased two classe ca150's running in a vertical bi-amp. if i had known how good tubes sound i would have done this long ago. the prima luna amp is the best sounding amp i have ever heard in my system. no more transistors again ever!!! !